With toddlers (children under 3), Distract and Redirect is one of the most powerful parenting tools you can use! Children at this young age are often interested in doing things that they can’t really do appropriately. Ie. They want to touch baby sister, but even when you show them 3 times how to do so gently, they might still slam their hand down over baby’s face. Taking time to teach the appropriate skill is important (ie. “Here is how we can touch sister gently…” – and show them and guide their hand to do it gently). However, some children at this age might not have the muscle control or self-control to be able to follow through appropriately. There is so much still developing in their little neurons that they may not fully understand the speed and location of their touching sister is not the same as when mom demonstrated. In this case, after a few tries, it is totally okay to distract the child and redirect them to another activity that they can do appropriately. This might mean redirecting to a toy, an activity, or a different way to interact with sister: “Hey, could you bring over that toy for sister?” All are effective ways to use distract & redirect with a toddler. It’s also the perfect alternative for using “No” too often. Instead of “no”, you can just focus on distracting and redirecting the child to what they CAN do. I will write some more on this soon because it’s been on my mind a lot lately. Read more about this great parenting tool: Distraction & Redirection here. Cheers to your happy toddler parenting! Parenting is a lot like learning to drive in Montana winter weather. In the most heart-pounding moments, you are told to go against your natural instincts. Just drive slow and steady. Ok. I can do that. IF you have to break, don’t let your reflexes slam down the pedal. Resist your nature and pump the breaks instead. Getting a little bit harder to picture doing in the heat of a scary moment. If you happen to have a deer jump out faster than you can break, it’s better to hit the dear than to swerve and likely roll your car. What?! That does not seem right? That would go against every bone in my body. The same is true in parenting. In the most heart-pounding moments, it’s often more effective to go a bit against your natural insticts. But it is definitely worth it! When I notice my child isn’t listening, my instint is often to repeat myself or speak louder and louder until I’m yelling, and eventually maybe even resort to some threat/intimidation tactics to GET HIM TO DO what I have TOLD him to do! Not usually as affective as getting down to the child’s eye level and connection before correction, asking instead of telling, or deciding to stop trying to MAKE them do something, and instead deciding what you will do and following through. I’ll tell you a bit more about all of these parenting tools in a moment. These are 3 of my favorite parenting tools and they come from Positive Discipline, created by Jane Nelsen and Lynn Lott. Even though they are challenging often in the heat of parenting moments, they are the most effective long-term. Picture this challenging moment: I’m walking to the car with at 5pm with a 1 year old. I lift him towards the car seat and am met with a bone curdling scream in my ear a hip thrust forward and kicking legs. One of his legs kicks me in the side of my stomache. I am frustrated! I’m tired from a long day, I just want to get home to eat dinner and enjoy the help of my husband, who should be home from work when we get there. This is NOT what I want to be dealing with. Instead, I pause to connect before I correct. I pull him away from the car seat, back onto my hip so I can put a hand on his back as I speak softly. I say something like “whoa, whoa, whoa. Hold on a moment. I can tell you don’t want to go home. You were having so much fun in our music class weren’t you? That was such a fun time! It’s hard to leave places that are so fun, huh?” With each word and stroke of his back, I feel his body relax incrementally, appreciating the validation. Then, I continue with correction. “But wait. Let’s look. Look at the other kids getting into their cars. The class is done. No one is staying here. We are all headed home to see mommy’s and daddy’s and have dinner. And we get to come back next week for music again. Let’s go home and see daddy!” He nods and I lift him towards the car seat with no resistance at all. We buckle up and head on our way. Really only 2 minutes were lost in the time it took to connect before correction of his behavior. And it was well worth it. It’s a major shift in how we teach our children. Teaching doesn’t have to involve the adult doing all the thinking. *In fact, it’s WAY better if the adult isn’t doing the majority of the thinking. Curiosity questions are a way to use dialogue to get the child’s brain to have to think about the answer. 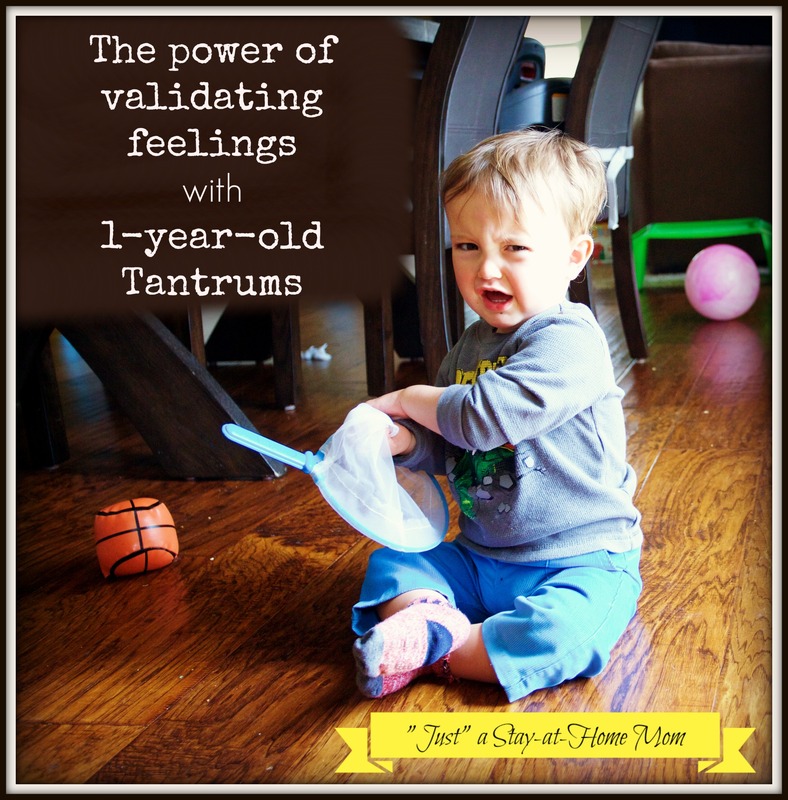 It’s much less likely to trigger the child tuning you out, or resisting with “No”. Decide what you will do, & Follow-Through. Instead of trying to MAKE a child do something. There are times you can Just decide what you will do and follow through. Connect before you Correct, Asking instead of Telling and Deciding what YOU will do & following through. These are all parenting tools that I believe are challenging to our natural instincts, but will help you get through the storms of parenting with the outcomes you really want. This is a Tool Card, created by Jane Nelsen and Adrian Garsia. In a recent 3-part parenting workshop where I shared Positive Discipline parenting tools, this was one of the biggest hits! Sometimes you don’t even have to use words. When your child is having a meltdown about not getting his way, you can simply offer comfort by getting down to his level and stretching out your arms. Be sure that you don’t change the limit you just set because that could send the wrong message. 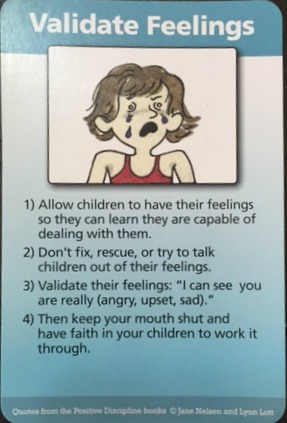 The intent here is that you can still offer your child empathy, even when you have set a limit. Empathy is always the gateway to bringing a child from where he is (emotionally), to where you want him to be. 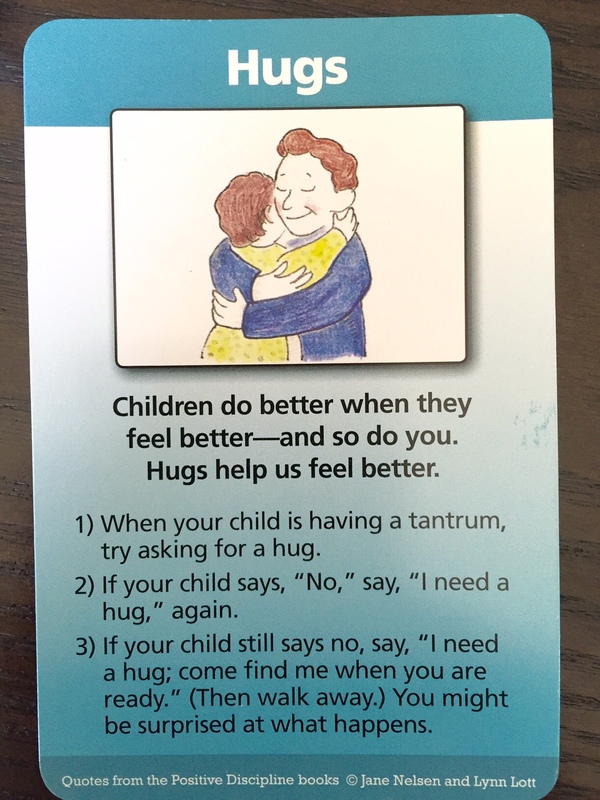 (Learn more about this idea by reading “Raising an Emotionally Intelligent Child” by John Gottman). Last month I had a 3-part Parenting Workshop series on Positive Discipline. I LOVE the tools of Positive Discipline and encourage parents everywhere to check out their resources. Click here to visit Positive Discipline You can check out their books here. Here is a quick tip to be less frustrated/angry when you follow-through.